The story of the design of Corpus Christi Church starts with a congregation that knew not only who they were but also who they wanted to be. A very community-minded parish, they wanted to express their focus on the importance of the people in their parish. Since replacing their pews with flexible seating when they renovated and expanded their original church in 1984, they had experimented over time with various seating arrangements, including the occasional use of an arrangement where portions of the congregation sat facing each other (sometimes known as an “antiphonal” arrangement). Through these experiments and other community-building initiatives, they had created a true sense of community within the parish. As they contemplated building a new worship space, one of the most important criteria became the need to express their understanding of communal worship in the design of their new worship space. Working with a well-informed and widely traveled committee, we explored the usual range of options for seating arrangements that could accommodate 1,000 people. 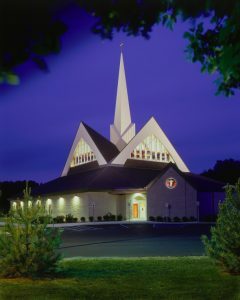 We looked at other similar size churches but found that they all lacked the intimacy that the parishioners had grown accustomed to in their 450-seat worship space. Committee members began to wonder how they would continue to encourage the full and active participation of the assembly as seats got farther and farther away from the Presider. The pastor, who was also on the committee, was equally concerned that they would be moving back into the typical stage/audience arrangement of pre-Conciliar churches, even if the seating were not all in straight rows. Reflecting on his experiences with antiphonal seating arrangements for daily office in the seminary as well as similar arrangements in the present church, he asked the committee to think about employing an antiphonal seating plan in the new church. He presented a collection of research he had done on antiphonal seating to the committee. While some committee members were quite open to the idea, others were strongly opposed to it. Their concerns ranged from the lack of tradition to distractions from people moving about the space. In the midst of these discussions, I attended a FORM/REFORM conference in Chicago. At that conference, I had two very valuable experiences. 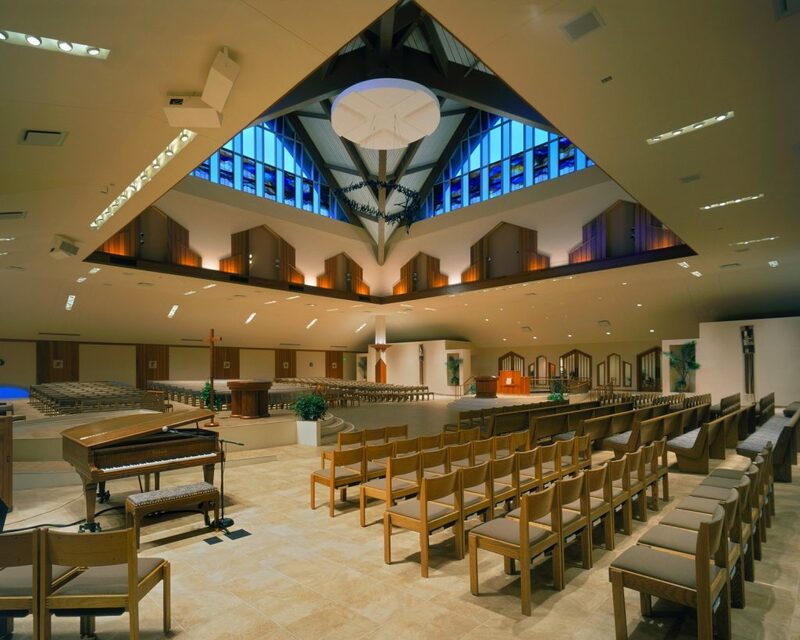 One of the tours was to St. Anne Church in nearby Barrington, a new 1,300-seat church with an antiphonal plan. The other experience was a worship service at the conference where the seating in the hotel ballroom was arranged antiphonally. I felt that the arrangement was not very successful at the conference so I returned to St. Anne for the Sunday evening liturgy to experience worship there. It was a completely different (and gratifying) experience. I studied the differences between the two arrangements and made notes as to what made St. Anne successful. When the committee asked me for my thoughts on antiphonal seating, I was able to relate to them these experiences. I presented them with a 3-page description of my experience at St. Anne, describing every aspect of the experience, from arrival to dismissal. I also presented comments that I had gathered from liturgical design consultants who had experience with this type of seating arrangement. All of this information had most of the committee convinced that an antiphonal arrangement would serve the parish best, but not all. They still had concerns that they wanted addressed. Arranging a site visit for the entire committee was not practical, as we were on the East Coast, but I was determined to respond to their concerns. I contacted the pastor of St. Anne to ask about some of the committee members’ concerns. He not only answered every question, he offered to send us a video of the space in use. Well, if a picture is worth a thousand words, a video is worth a million! The video not only allayed all of their fears about the arrangement, it conveyed to them the same things I experienced when visiting there. They could immediately see how such a plan worked very well for encouraging participation and making the liturgy an act of public worship. By this time, all but one of the committee members was convinced but, in the spirit of the consensus process we had been using, she agreed to support this direction. We then proceeded to try and capture the effective design elements of St. Anne in our own worship space. We understood that a sloped floor was essential for allowing the assembly to see one another. We carefully deliberated over the distance between the altar and the ambo, realizing that just the right distance between them would maintain the necessary connection between the Liturgy of the Word and the Liturgy of the Eucharist without creating too much or too little empty space in between. Eventually, we arrived at what we felt was the perfect floor plan. We had proposed a rather traditional exterior for this new church during the Schematic Design phase of the project. It had been presented to the parish and accepted. But as we continued to develop the interior design, we saw that there was a conflict between the new seating arrangement and the building structure. The original design had one, long axis that created a focal point at one end of the building or the other. With the antiphonal seating plan, rather than focusing on the altar or ambo, the design of the new worship space would have to focus on the people who are worshiping together. We realized that a whole new building design would be necessary so we went back to the drawing board. Soon after, we presented a completely new building design that was much more sympathetic with the new seating arrangement and the theology it embodied. The geometry of the new building design created two equal axes, one in the direction of the altar, ambo and baptismal font and the other in the direction of the people. Light would enter the space through very low windows on the east and west walls and four large, glass gables over the center of the space, providing daylight without glare. This concentration of light at the center would emphasize the centrality of the plan. The stained glass windows from the current church, along with two, new stained glass windows, would be placed along the bottom of the east, south and west gable windows to provide continuity with the past. The center of the space would be empty, save for a modern sculpture representing the death of Christ suspended from the center of the ceiling. This arrangement allows the focus of the participants to easily shift from altar to ambo, each time taking into the field of vision the faces of the other half of the congregation. The open space in the center allows for communal events such as weddings and funerals to take place in the midst of the assembly, with equal visual access for all. When the time came to design the baptismal font, many committee members were questioning the need for a font large enough for adult immersion. They were once again focused on the logistical issues around adults getting all wet in the middle of the Easter vigil and the mess associated with that. Once again, I let a video do the talking for me. I showed them a video of an adult kneeling in a large font and having a great volume of water poured over him. As the water rushes over his head, you could see his breath being taken away from the shock of the water. The look of utter joy on that young man’s face once he caught his breath was all the convincing the committee needed. 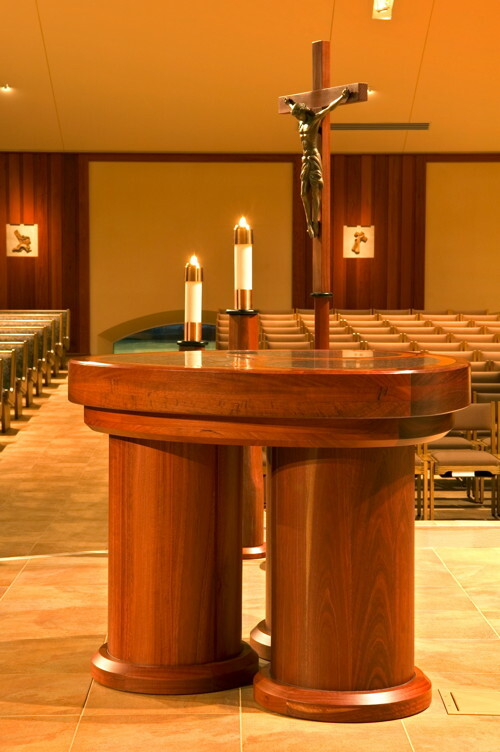 Not only did they agree that an immersion font was a necessity, they decreed that it should be as large as possible, so that everyone who entered the church would know that they are a baptismal community and that no one who passes it on their way into the worship space would forget its importance as a symbol of God’s forgiveness offered to us throughout our lives. 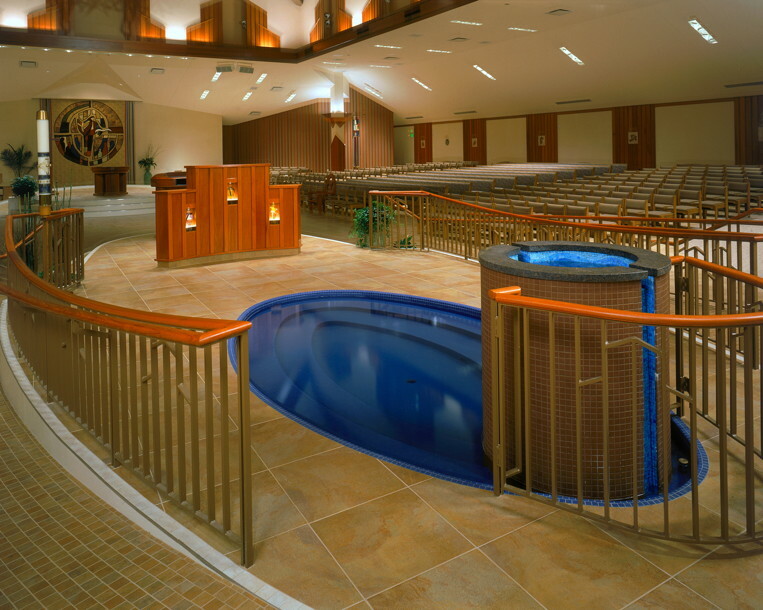 In its elevated location, it is possible for the congregation to fully participate in the baptisms of both infants and adults. The focus on community continued with the design of the liturgical furnishings. One of the committee members suggested that a square or rectangular altar would mean that most people would be looking at the side of the altar and a circular altar not in the center of such a symmetrical building would disturb the balance of the space. She suggested that a triangular form might be more approachable and appropriate. She was right. 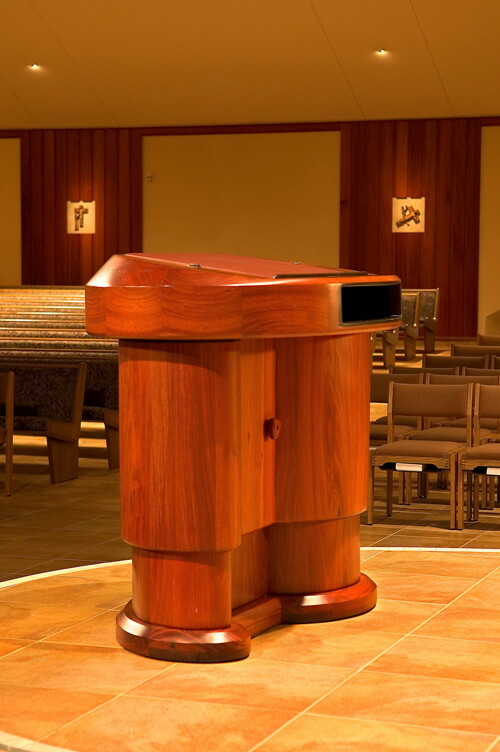 The new altar, made of Jarrah wood from Australia with inlaid granite and Honduran Mahogany accents, invites the assembly to participate in the action of the Presider as he celebrates the Eucharist. The disabled members of the parish were equally important to the committee so the ambo was designed to be adjustable, so as to accommodate wheelchair uses. 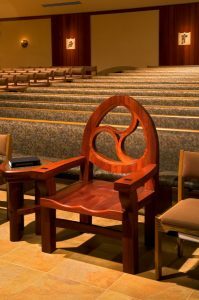 The Presider’s chair and tabernacle continue with the soft, curving lines of the other liturgical furnishings to emphasize the focus on welcoming and gathering. This article was originally published in the May 2008 issue of Ministry & Liturgy magazine. All photos by Randall Perry Photography.